Stratford’s swans strut their stuff en route to their summer digs. 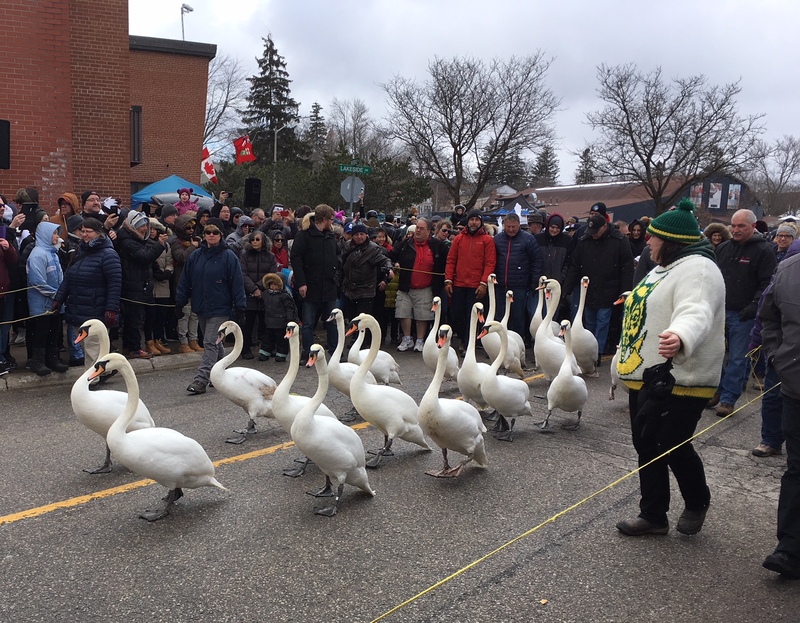 Despite snow flurries, a patina of ice on portions of the Avon River, and threats of cancellation, the sun came out and the 28th annual Stratford Swan Parade came off without a hitch, much to the delight of some 1,000 spectators from as far away as India, China, and Mexico. Many people think of Stratford’s swans as a sort of logo for the Stratford Festival, which was founded in 1953. Indeed, many swans desport themselves on the bank just below the Festival Theatre during the summer. But there were swans on the Avon many years before the Festival arrived. Mute swans are not native to the area, so Stratford’s birds are “pinioned” to prevent all but the shortest flights and are cared for by the city during the colder months of the year. They reside comfortably in heated winter quarters with a pool. Come the warmth of Spring (or what passes for it in Canada) they are returned to the freedom of the river. Originally, the city simply opened the doors and shooed the swans 2,000 feet down Lakeside Drive to the river, but the sight of some twenty swans waddling along is kind of irresistible and as word spread the crowds grew. In 1990, the city made its annual swan release a full-fledged event. Today, the event is marked by a competition among Stratford businesses for the most imaginatively decorated topiary swan, plenty of activities for children, and puppet shows. 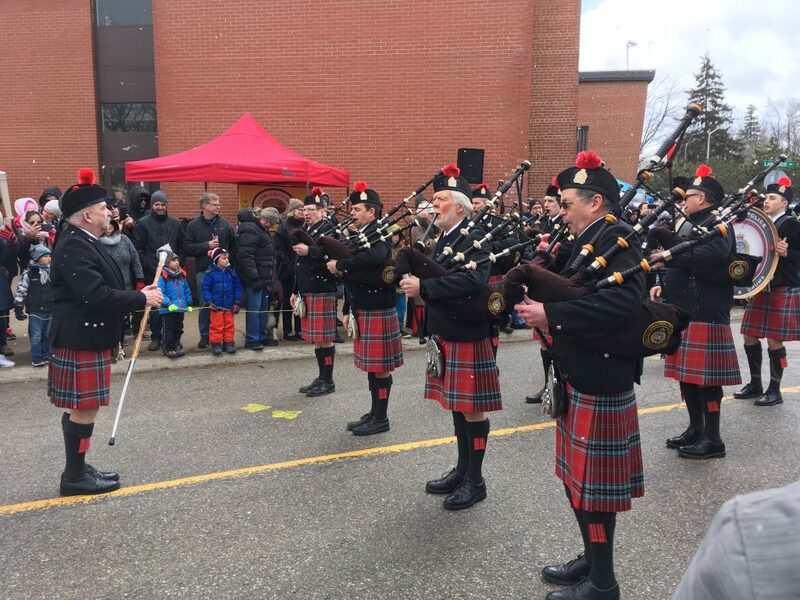 The grand finale occurs when Stratford’s swans are ceremoniously piped to their summer home by the Stratford Police Pipes and Drums, resplendent in their kilts. It’s all over in about ten minutes, but people linger along the banks of the Avon to watch as pairs fan out to scout nesting sites or exult in the short flights their pinioned wings allow. Have you ever dreamed of living in Paris? 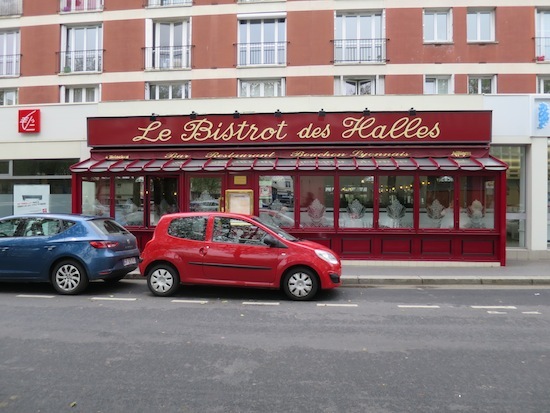 Of having your own little pied a terre in the City of Light? Perhaps even moving there and settling down? 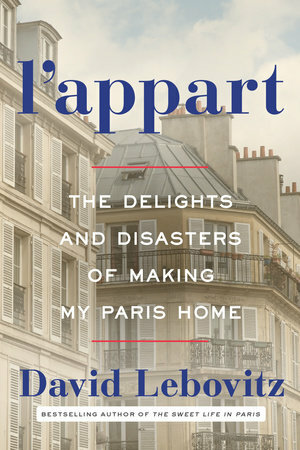 If that’s you, I have some good news and bad news about L’Appart: The Delights and Disasters of Making Paris My Home, the latest book from expat pastry chef and food blogger David Lebovitz. The subtitle says it all. Let’s deal with the bad news first. Unless you have limitless patience to go along with your limitless bank account, you probably don’t want to follow in Lebovitz’s plaster-begrimed footsteps. As he tells it, renovating an apartment in Paris is a never-ending nightmare. Just buying the place to begin with is no picnic either. I have my issues with port calls when cruising. For starters, there’s the sheer size of today’s vessels. Often there are two or more visiting on any given day, each of them disgorging the population of a small town into often-small towns. Tallinn’s historic city center seen from a helium balloon, nearly 400 feet in the air. The tallest spire belongs to St. Olaf’s Church. The Lower Town is in the foreground, with Toompea Hill in the back. This is the second of a series of articles on Estonia. Read Nadine Godwin’s previous article here. TALLINN, Estonia — In 2014, a vendor introduced balloon trips that give visitors a bird’s-eye view of the historic center of Tallinn, Estonia’s capital. The tethered balloons, using helium, rise to almost 400 feet above the ground. Passengers get a sweeping view of the Old Town’s tallest churches, narrow streets lined with centuries-old buildings as well as defensive walls that have stood since the Middle Ages. The vendor is Balloon Tallinn, and its 15-minute airborne excursion costs 25 euros for adults, with concessions for the young and for families. The Old Town, home to 3,000 of Tallinn’s 400,000 people, is so well preserved the whole thing is a UNESCO World Heritage Site. The elevated viewing is great for getting the picture — lots of them, in fact — but it’s no substitute for exploring such a valuable piece of real estate on foot. 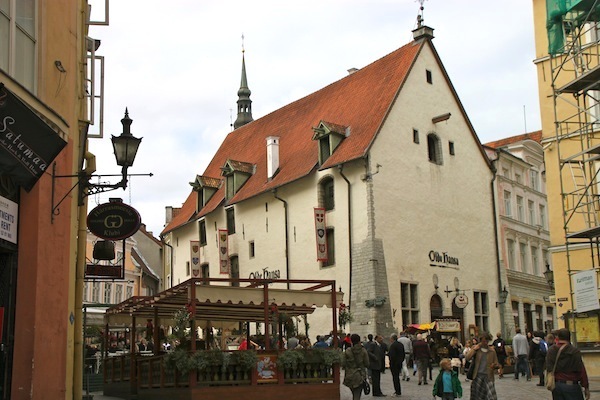 Tallinn’s Town Hall Square, where old houses are often now restaurants with outdoor seating in good weather. 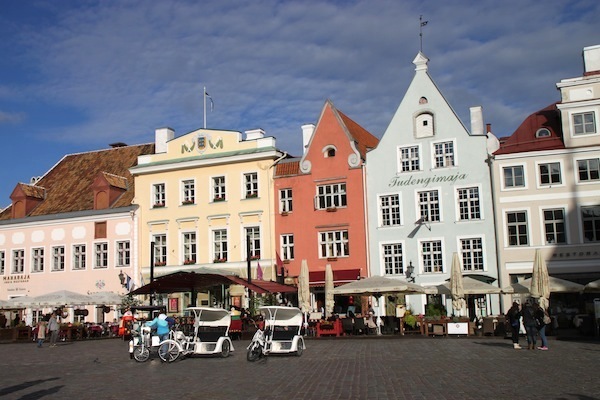 I recently visited Tallinn as part of a press trip sponsored by the Estonian Tourist Board. The balloon excursion enriched a visit that also featured plenty of nosing around at ground level. Tallinn first appears in the chronicles in 1154 and by 1284 was a member of the Hanseatic League, a German-led exclusive trading cartel. Much of what we see on the tourist circuit today has its basis in league-generated wealth. Our guided walking tour started in Town Hall Square. The gothic city hall there, now a museum and concert hall, was built in 1404. 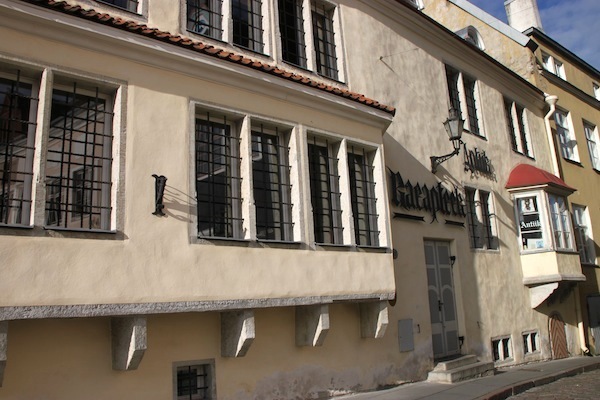 Raeapteek, described as Europe’s oldest continuously operating public pharmacy (1422), is on the same square. Besides, the tourist board says, the first-ever Christmas tree stood in this square in 1441. Raeapteek, on Town Hall Square, described as Europe’s oldest continuously operating public pharmacy. 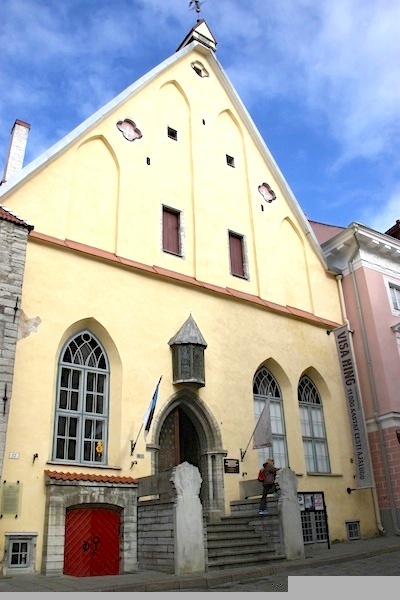 Also from the 15th century (1410), the Great Guild Hall, once home to the most powerful of the merchant guilds during Hanseatic League days, is a block away on Pikk Street and now houses the Estonian History Museum. Great Guild Hall, home to the most powerful of Tallinn’s merchant guilds during Hanseatic League days. 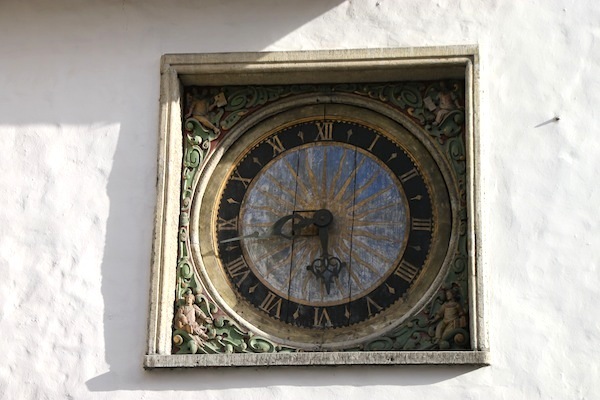 Its near neighbor is the white Holy Spirit Church (14th century) well known for a painted wall clock that has kept time since the 17th century. Other former guildhalls are on Pikk Street, as well. The painted wall clock on the exterior of Holy Spirit Church. While tenderly caring for these old places, Estonians also make use of them. The Olde Hansa restaurant, in a medieval building, features period menus and staffers in period clothing. Many medieval merchant houses are now restaurants, some with staff in period costume, such as at the Olde Hansa eatery. Its menus keep to the theme, too. 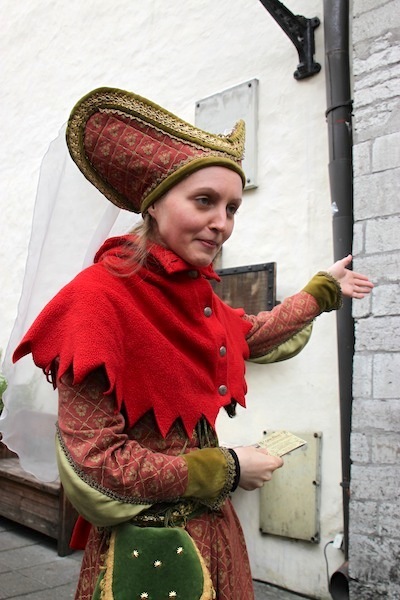 A staffer at Olde Hansa restaurant, in period costume, urging passersby to try the eatery. Medieval merchants were called peppersacks reflecting pepper’s value. Hence, another period restaurant is called Peppersack. And the nearby Hopner Beer House, does beer pairings. These three establishments sit at a convergence of streets a few steps behind the old Town Hall. 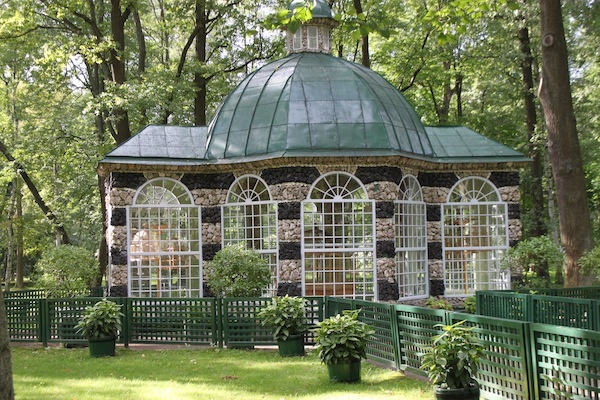 The Bird Cage, an aviary pavilion, on the grounds at Peterhof. ST. PETERSBURG, RUSSIA — The tsars made St. Petersburg their capital for 200 years. As a result, this northern Russian city and its outskirts are, even today, rich with imperial palaces, now repurposed as museums, hotels, government facilities or headquarters for other organizations. 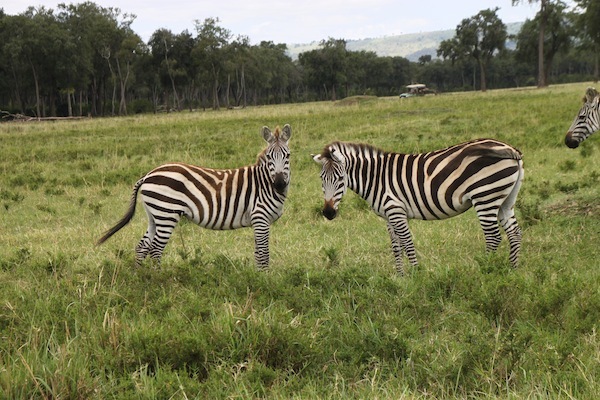 Zebras on the Maasai Mara in southwestern Kenya. 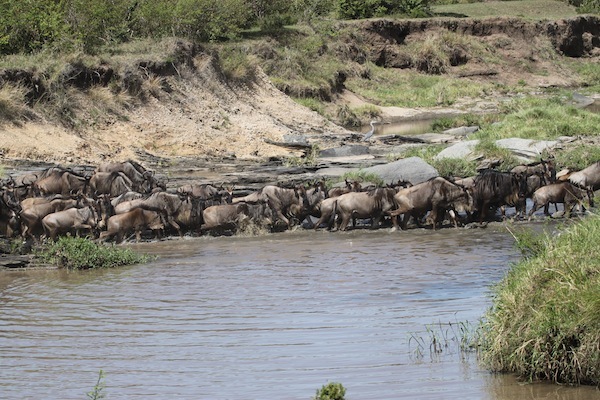 ON THE MAASAI MARA, Kenya — I had known about the Great Migration — the annual movement of herbivores across the grasslands of East Africa — but I did not know that wildebeests imitate their migratory behavior on a regular, less-grand scale. During a recent morning’s game viewing on the Maasai Mara, another journalist and I saw one example of this, as the animals moved en masse from one grassy plateau to another. To effect that move, the animals had to cross a gully and the Ntiakitiak River, which — for good reason — they did at a run: There was a crocodile in the river near the wildebeests’ legs, looking for lunch. Wildebeests run across the Maasai Mara’s Ntiakitiak River to get to the grasses on the next plateau. The Maasai Mara area (encompassing the Maasai Mara National Reserve and neighboring private conservancies in southwestern Kenya) is famed for its place in the Great Migration. Broadly speaking, the animals move in a circle, departing from Tanzania’s Serengeti National Park and flooding onto the Maasai Mara plain in mid- and late summer. The return trip to Tanzania, at the end of the year, is more gradual. In my book, Travia: The Ultimate Book of Travel Trivia, I reported that an estimated 3 million to 3.5 million animals make the move, about half of them wildebeests. 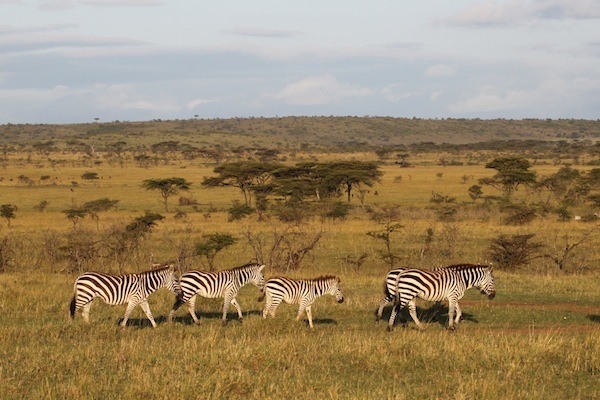 The line of wildebeests, zebras, gazelles, the predators that live on them and others can stretch across the landscape for 25 miles at the height of the relocation. At the time of my recent sightings, I was part of a press group hosted by the Kenya Tourism Board. Our group spent a significant portion of our time on the Maasai Mara National Reserve and in the adjacent conservancies. Thomson’s gazelles breakfasting under bright early morning light, on the Maasai Mara. When we visited the Maasai Mara, most of these animals had just returned to Kenya. We were thrilled to see what I call a mini-migration, during which thousands of wildebeests moved a fairly short distance, but en masse. They were seeking grass, which is the motivator for the Great Migration, too. Duncan, our driver/guide, said wildebeests regularly move together in large numbers because they have a tendency to behave like lemmings. He said, “Once one decides to do it, others follow.” We saw the animals lined up beyond our horizon. Some of them ran just to join the line — or maybe jump the line. 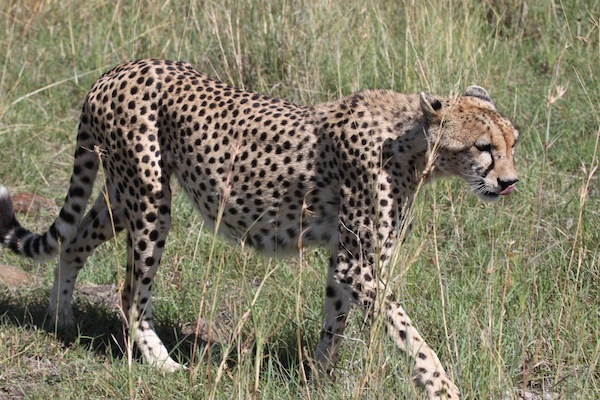 Undeterred by a tourist vehicle, the cheetah strides very close to her visitors. 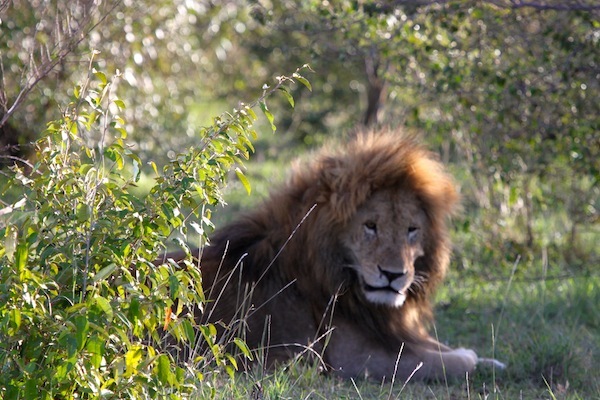 ON THE MAASAI MARA, Kenya — I have two cats at home, which probably makes me just that much more likely to enjoy game viewing that includes some of the big cats. I was lucky enough to do that recently, when I joined a press trip, sponsored by the Kenya Tourism Board. Jeeps and driver/guides for our group’s game viewing were provided by the Sanctuary Olonana tented camp, where we were hosted one night, and Great Plains Conservation, which owns two camps where we were guests, Mara Plains and Mara Toto. Our group watched the big cats several times on the Maasai Mara National Reserve or, at times, while in nearby privately held conservancies. Isn’t he the true Lion King? We saw the lions first. With one exception, though, that was not where the action was. Generally, the cats were doing what cats do very well — sleep, stretch and yawn. 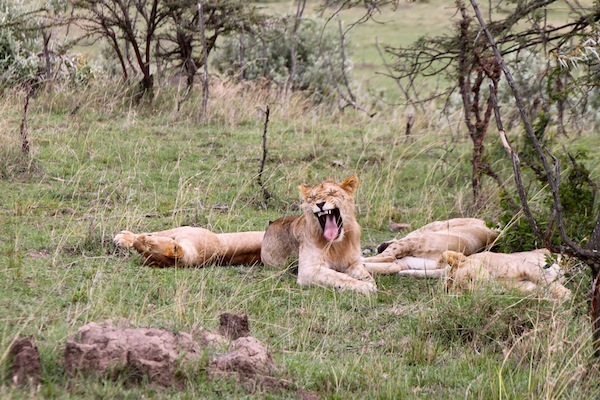 Lions know how to enjoy a good yawn. In the one exception, a lion pair was doing what comes naturally to make those cute little cubs. And, we were probably indecently amused. The family that naps together stays together. 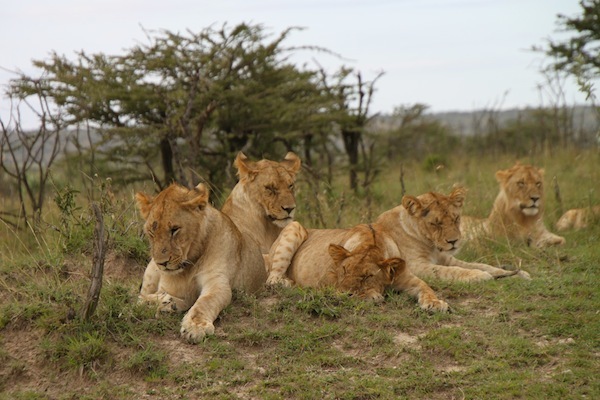 These young lions are seen on the Maasai Mara. As it turned out, out observations of leopards and cheetahs were more gripping — although, in no case, did we see a kill. Fine by me. 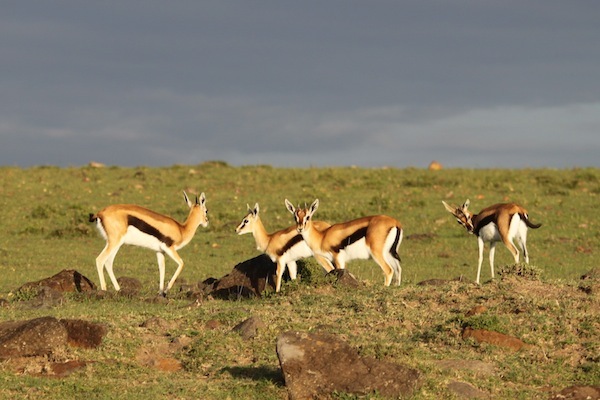 One of our guides could not resist referring to gazelles as cheetah chips. He also called the wildebeest lion sausage. The Watchman from Pa’rus Trail. Tucked into Utah’s southwestern corner, not far from the Arizona and Nevada borders, Zion National Park draws over two million visitors a year, a testament to the spectacular beauty of the park’s Zion and Kolob Canyons, its many hiking trails, and other opportunities for outdoor adventure. Don’t let those visitor numbers discourage you. 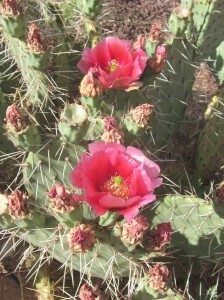 Arrive early in the morning or late in the afternoon and you’ll find popular trails fairly quiet, even in summer. You won’t have them to yourself, but there’ll be few enough people on them that you’ll often feel as though you do. 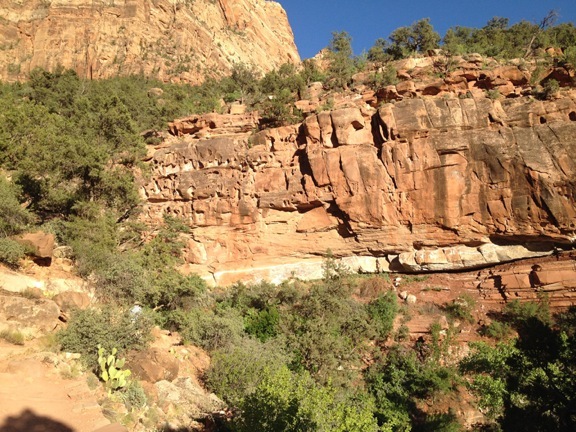 Canyoneering, rock climbing, and multi-day backcountry hiking opportunities also abound—some of them in Zion and Kolob Canyons and others scattered around the park. Visitors looking for less strenuous options can drive three scenic routes through and adjacent to the park—though not up Zion Canyon Scenic Drive itself for seven months of the year. To minimize traffic and carbon emissions, the canyon road is closed to private vehicles and serviced by complimentary shuttle buses April 1 through most of October. The shuttle ride from Zion Canyon Visitor Center at the South Entrance to the end of the drive and back takes about 80 minutes. Buses stop at the park’s museum, Zion Lodge, and trailheads. 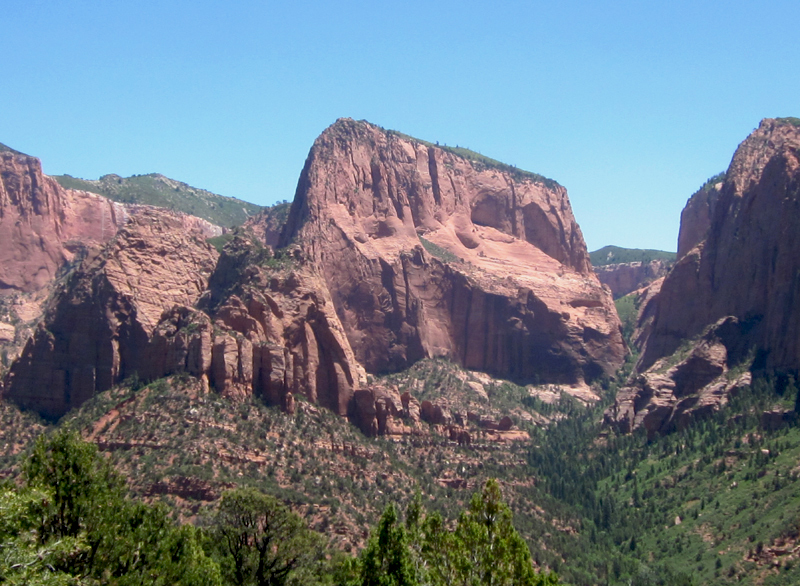 View from Kolob Canyons Road in the northeast corner of Zion National Park. 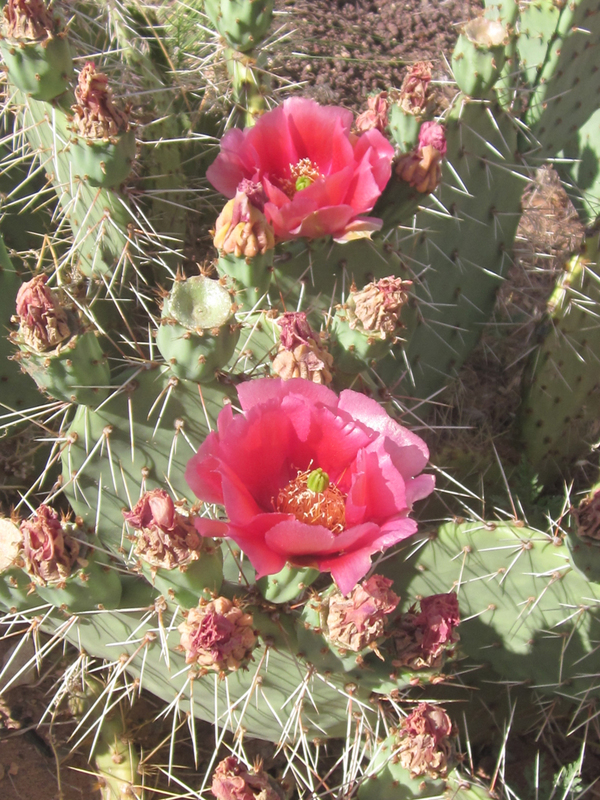 Lodging & eating: The park offers accommodations in Zion Canyon (in Zion Lodge and two campgrounds with a total of 309 campsites but no showers or laundry facilities) as well as in six campsites on the upper Kolob Plateau off Kolob Terrace Road. Its only food service is in the lodge. Wilderness camping is allowed but requires a permit and payment of a fee. 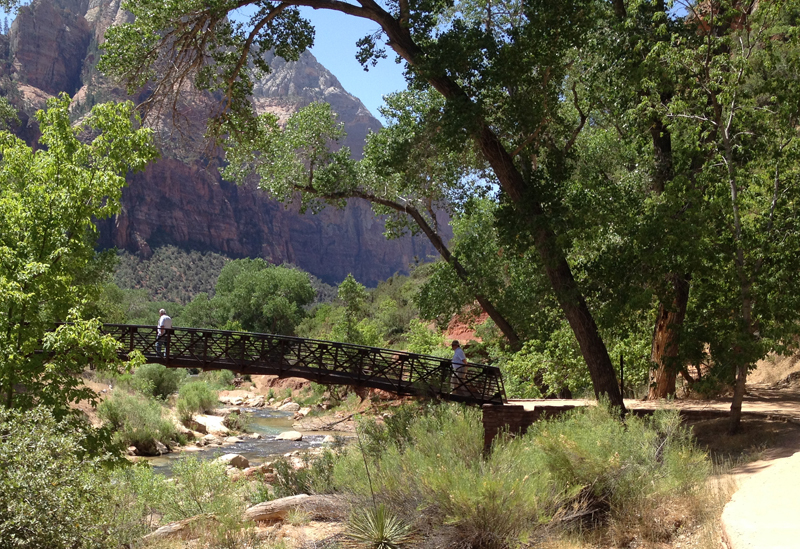 Bridge near Zion Lodge connects visitors to trails. We did not stay in the lodge, but the buzz is that the place is all about location, location, location. Accommodations are somewhat dated and the walls can prove distressingly thin. The restaurant, however, gets high marks. For those who prefer softer beds, hot showers, and a variety of restaurants, art galleries, and shops within walking distance, Springdale, Utah, located just south of the park’s Zion Canyon entrance, has plenty to offer—plus frequent, free shuttle buses April through October to take you to and from Zion Canyon Visitor Center. Springdale is also a great place to refuel after a strenuous day of hiking and exploring Zion, and many eateries get rave reviews. We were so taken by Café Oscar (948 Zion Park Blvd, 435-772-3232) on our first visit that we never bothered to sample other fare. Their Southwestern dishes like Chili Verde Tamales and Pork Chili Verde Burritos are addictive and the Murder Burger is, to coin a phrase, to die for. Wash it all down with a hearty pint of Polygamy Porter. Then come back for breakfast and try the Pork Verde Breakfast Burrito. Why mess with success? Getting there: Las Vegas, 163 miles to the southwest, and Salt Lake City, 307 miles to the north, offer the nearest major airports. We chose Vegas. Driving east from the Nevada border, we were greeted by mostly gray hills with interesting rock formations. Then, a few miles from the entrance to Zion Canyon, the sandstone hills take on varying shades of red, russet and pink, which blossom into a spectacular array of colors and shapes as you turn north to enter the park. One of Zion Canyon’s colorful walls. What would a Vegas casino be without an opportunity to win a small fortune and immediately spend it on a single meal? 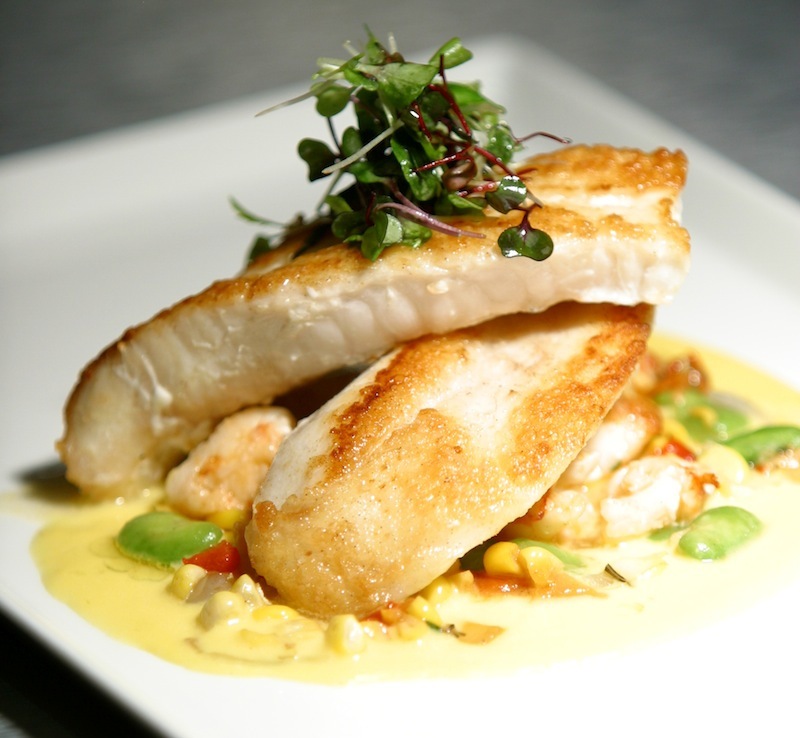 While the Venetian Resort Casino on Las Vegas’ fabled Strip has a number of marquee names in its stable of restaurants (Batali, Bastianich, Lagasse), you would be hard pressed to beat the cuisine at AquaKnox, just a few steps from the casino floor along the Venetian’s Restaurant Row. The chef, Steve Aguglia, is not a star, at least not yet, but he is turning out some astonishingly good meals. ($79 for two) is an excellent introduction to their quality standards. It’s hard to believe that in the middle of the searing Nevada desert you could find fresh oysters, mussels, shrimp ceviche, lobster, and king crab like this. A highlight of this indulgence are the Ponzu oyster shooters, sheer heaven. Other seafood we sampled included New Bedford Scallops ($42) on a bed of creamed corn and polenta garnished with crispy chicharron and Wild Alaskan Halibut, ethereally light over a shrimp, corn, and edamame succotash. Seafood graces the appetizer selection as well with the Ahi Tuna Tartare ($18), flecked with Asian pear and spiced with Korean hot bean paste, a standout. But don’t overlook the Desert Bloom Squash Blossoms ($18), sourced from a local organic farm that apparently creates miracles in the desert sands. ($12 to $13). There’s a very nice take on Banana Cream Pie but the star of the show, for my money, is the Butterscotch Bread Pudding, a seemingly humble dessert raised here to sublime heights. 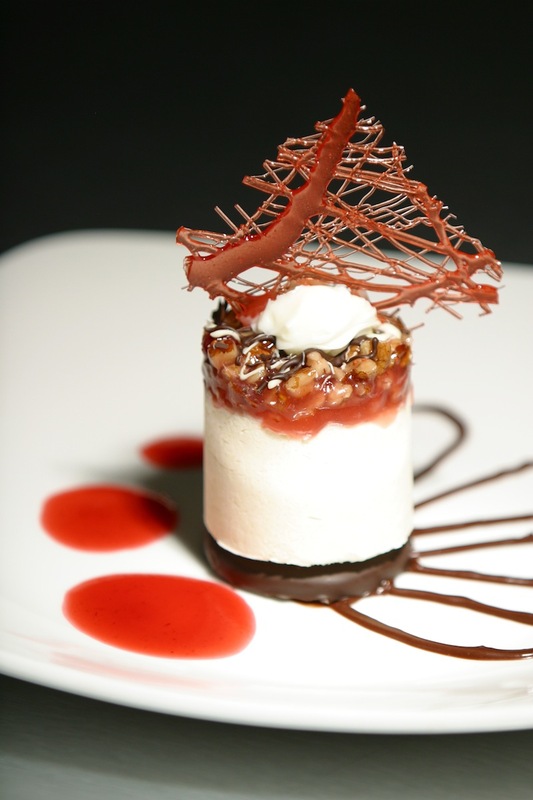 If you really want to pull out all the stops, call ahead to arrange a “Tour of the Menu,” a four- or five-course tasting menu with optional wine pairings. The staff will discuss your dietary dos and don’ts and will put on a smashing show. 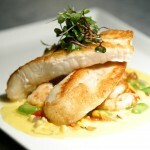 Expect to pay up to $200 per person with pairings for this very special experience. Wines by the glass range from $10 to $23, and the selection is excellent. Their Tavistock Pinot Noir, available nowhere else, is a personal favorite and pairs beautifully with the steaks. Choose a bottle and the prices quickly become stratospheric. The wide-open entrance and the hip bar at the front only hint at the quiet elegance to be found in the restaurant’s interior. 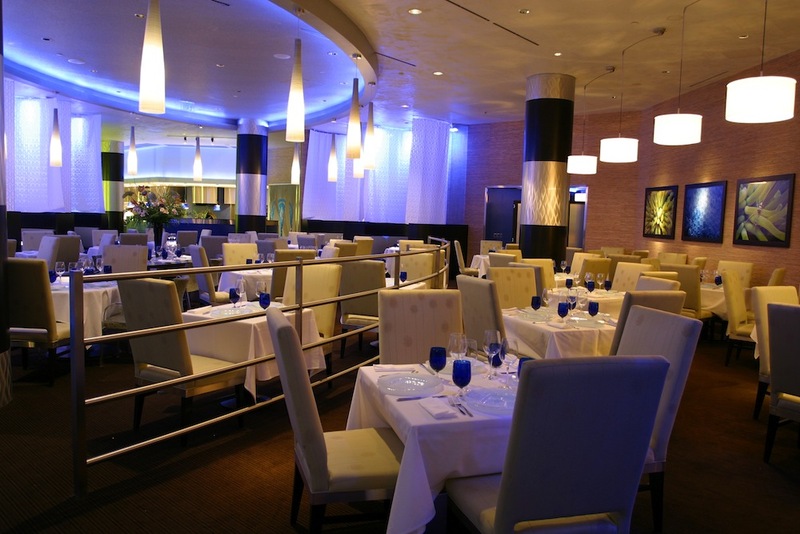 The seating is plush, the tables widely spaced, and the noise level blissfully muted. For extra calm request one of their discreet semi-circular booths. 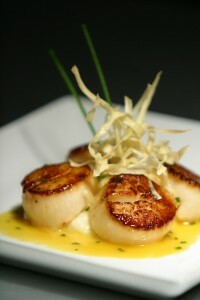 The servers are extremely knowledgeable about the menu and you can trust their suggestions for wine pairings with your entrée. The service is friendly and familiar without being overbearing or intrusive. 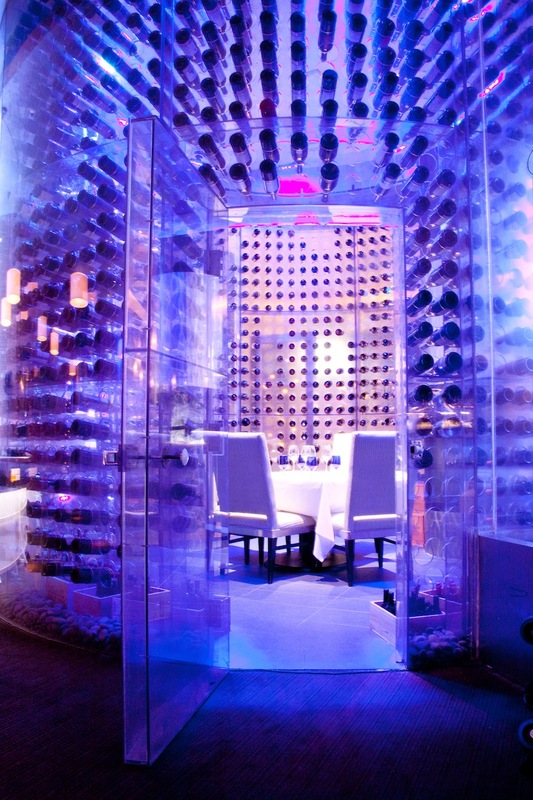 AquaKnox will be a special occasion sort of place for most of us, but if you are a high roller you could do a lot worse than make it your dining headquarters during your Vegas stay. Photos courtesy of Tavistock Group. LAS VEGAS, NV – Everyone loves acrobats but not everyone will have a tolerance for the non-stop, filthy, vile, obscene, and often very funny patter that accompanies them in this sui generis offering on the Vegas Strip. 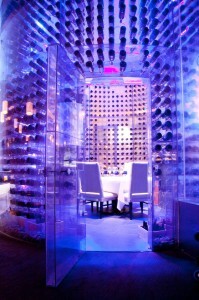 Absinthe is housed in what looks like a temporary storage shed in a courtyard at Caesar’s Palace. The interior looks every bit as ephemeral, with simple folding chairs packed around a stage (and I use the term loosely) that looks to be about the size of the average kitchen table. 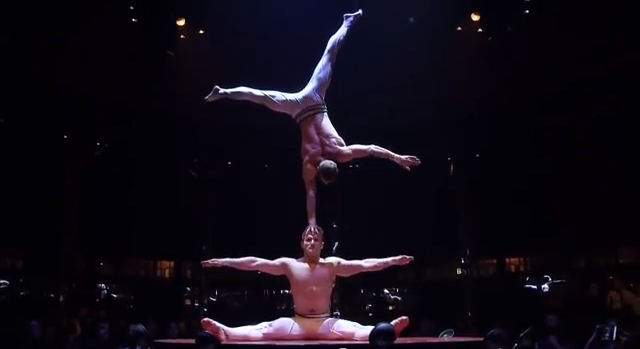 In this postage stamp space, Absinthe showcases acrobatic acts from around the world and some of them are doozies. Acts change from time to time, but among recent acts four Russian guys, a speed skating duo from Germany, and two Amazonian aerialists from the Netherlands were especially gasp-worthy. The spectacle is intensified by your proximity to the action and the fact that these artistes work without nets or safety wires. If they fall, they fall on you. Adding a bit of spice is a strip teasing chantoozie, the delightfully de-lovely Melody Sweets. But what has made Absinthe a Vegas sensation, I think, is its arch framing device. The show is ostensibly being produced and emceed by ”The Gazillionaire,” a snaggle-toothed, brilliantined sleazeball played with great relish by Voki Kalfayan, a former Cirque du Soleil clown. His opening line is “If you are offended by words like f**k and s**t, you’re at the wrong f**king show.” Don’t say you weren’t warned. What follows is a constant stream of vulgarity and sexual innuendo as The Gazillionaire seems to bend over backwards to offend everyone in the audience. And it works. The night I caught the show an older couple (she never cracked a smile) were driven out, an event that The Gazillionaire took as a personal triumph. Assisting the emcee is one Penny Pibbets (Anais Thomassian) who vies with the host in the vulgarity sweepstakes. At one point, she performs a crazed sock puppet routine that is breathtaking in its obscenity. The saving grace in all this is that the repartee is often hilarious and most folks in the audience get with the program and thoroughly enjoy themselves. As did I. By the way, the title is apparently derived from the absinthe-drinking acrobat whose chair balancing act opens the show. Tickets run from $99 to $134 plus tax and are available here.